As a community of software-driven businesses we help organizations and individuals solve problems with innovative solutions. Our goal is to make a difference in the lives of our clients, Protegrans, and the larger community. People are at the heart of every organization. Empathy, understanding, and respect are the foundations for all our relationships and for the designs of our solutions. Each of our businesses is based on one or several Protegrans who bring passion and an understanding to solving problems in that business domain. Using adaptive, iterative, and agile approaches to project execution, we deliver value to clients early and often. Leveraging the expertise of our entire team we design relevant solutions by working collaboratively with our clients. We immerse ourselves in the world of our clients to gain insight into their problems and opportunities. We're a community of businesses. We work together to improve the lives of our clients, your team - and your organization. Our clients tell us that our inherently collaborative culture, unique approach, and insightful solutions set us apart and add value to their experience. When you hire Protegra, you hire all of us. Founded in 1998 in Winnipeg (Canada), Protegra has built an excellent reputation for delivering software-enabled solutions to the public and private sector throughout Canada, the United States, Europe, and Japan. By remaining unwaveringly focused on people - our clients, those they serve, our team members and the community in which we live and engage - we believe success will follow for all. That is why we are a 100% employee-owned company and the reason we invest significantly into community associations and charities. Protegra is a long-standing member and sponsor of the Winnipeg Chamber of Commerce and Manitoba Chamber of Commerce, and is a proud sponsor of the MS Society of Manitoba's Annual Biking to the Viking. In 2015 Protegra built the MS Society of Canada's MS Walk and MS Bike mobile apps to help team communications and fundraising. 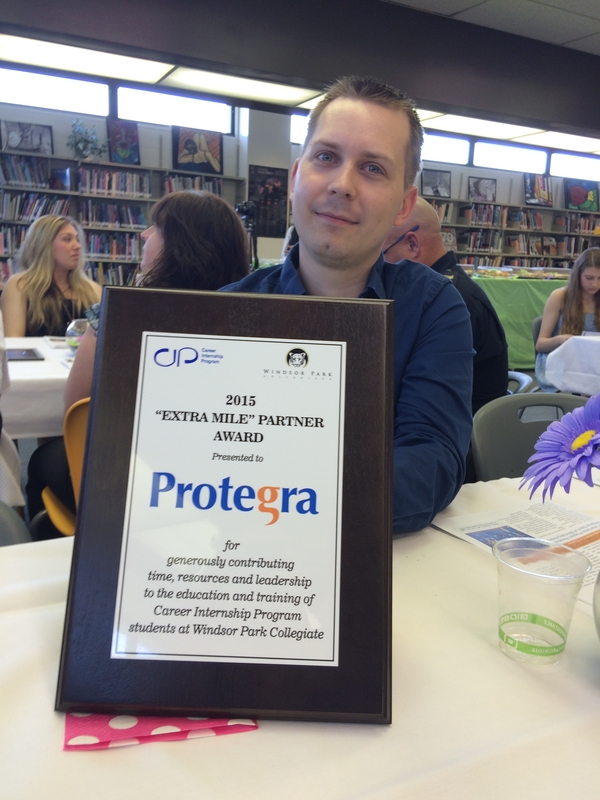 Protegra has consistently ranked in the top 20 best places to work in Canada (six years running) by the Queen's School of Business and Great Places to Work Institute. This translates to deeply dedicated and passionate Protegrans who deliver quality, every time. Working with Protegra and across all of our businesses will be your best and most memorable project experience. We believe that business can be done differently by focussing squarely on people. We look forward to meeting you and talking about how we can make a difference together. Does this sound like fun to you? Join us.